The beautiful beach pictured here is Trunk Bay on the island of St. John in the U.S. Virgin Islands. It takes a bit of planning to get here. St. John is the quieter, national park cousin of nearby St. Thomas, where you can shop until you drop and enjoy all the amenities associated with Caribbean resort life. St. John answers with quiet miles of pristine beaches and forests. To enjoy this place, you'll need to spend about $45 USD for a round-trip journey from Charlotte Amalie. It's more expensive if booked by a cruise line or some other intermediary. 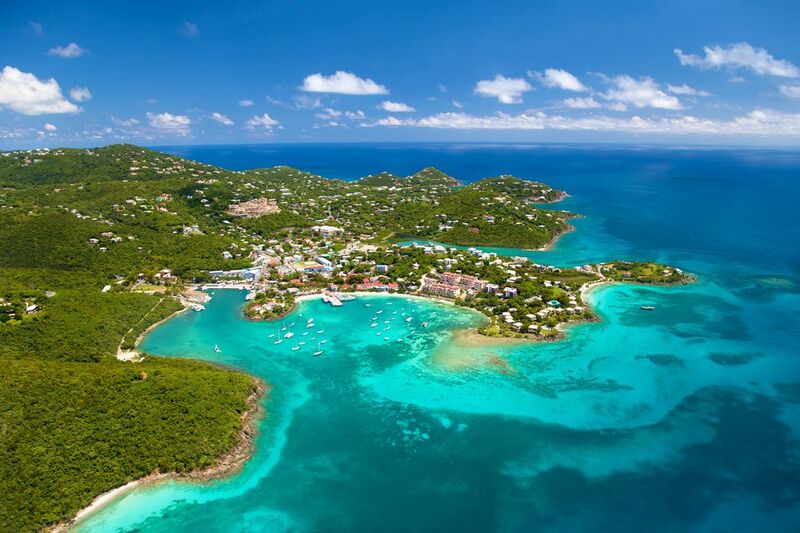 The tiny port town of Cruz Bay offers provisions, a few shops and some restaurant/bar establishments. But don't come here for any of that. Better reasons are snorkeling, sunbathing and the simple pleasure that comes from escaping the crowds. Most people will probably stay in St. Thomas and make the day trip, but St. John hotel choices can be quite economical and even educational. The beaches of Washington's Olympic Peninsula are not places you associate with sunbathing, sand castles and gentle currents. The rugged beauty of this area deserves to be explored, but with caution. At some points in the year, winds and rain here can be fierce. But the unique beauty is well worth the four-hour drive from Seattle. The rock formations are called stacks, and you'll also see acres of timber that washes ashore. Beyond the beaches, you'll see temperate rain forests, mountain passes and lakes. Camping is available at two points along the beach, and there is also the well-equipped, comfortable Kalaloch Lodge. Gasoline can be expensive, and you'll pay $15 to enter the national park. But it's an excellent value when the variety of experiences you'll have here are considered. If you ever see a storm sweep in from the ocean or a Pacific sunset, the experience will stay with you a long time. Between Los Angeles and San Diego, Laguna Beach is a favorite stop for beach enthusiasts. The exclusive shops and high-priced homes that share the coastline with this beach might intimidate some budget travelers, who would expect high prices for hotels and meals. But there are affordable places to stay for those who will look, and the moderate climate here is a refreshing change from the intense heat to be found inland. The Pacific Edge resort, right on the beach, sometimes charges as little as $155/night for rooms. At peak pricing, you'll pay about twice that amount -- still far less than one might expect in such expensive real estate. Beyond the beach, Laguna is well positioned to explore the various Southern California attractions on a budget. But don't forget about a nice, leisurely stroll on the beach close to sunset. It won't cost a dime, and you won't stand in line to partake. The Gulf Coast resorts of Mississippi and Alabama have been dealt some crushing blows over the past few years. Hurricane Katrina brought death and destruction in 2005, and then as recovery was progressing, an oil spill attracted worldwide attention. Tourists went elsewhere. These hard times have not discouraged the people who live in pleasant communities such as Ocean Springs. They're inviting people to share the beauty of this area, and sometimes the prices for food and lodging are quite attractive. The Inn of Ocean Springs offers a boutique-style lodging experience for under $120/night. Ocean Springs is a laid-back place where you might join in a pick-up beach volleyball game or enjoy the budding local arts community. A few miles west, the 10-room Balmoral Inn is an example of several family-owned budget hotels with prices starting at about $75/night. The Gulf is right across the street, and the rooms are spacious and quiet. If you're looking for South Beach nightlife, don't come to Hutchinson Island. Summer nights here are best-known for flashlights and turtle-watchers. That's right. An exciting night here involves watching green sea turtles come ashore and lay their eggs on the beach. If you've never experienced this, grab a flashlight and visit Jensen Beach, Stuart, or other coastal towns along the stretch of Atlantic coastline referred to in Florida as the Treasure Coast. It is among the world's most important nesting areas for green sea turtles and leatherbacks. Hutchinson Island's southern section is about an hour's drive north from Palm Beach International Airport. You will find upscale, expensive resorts in the area, but reasonably priced accommodations are easier to find here than in the bustling cities of South Florida. For example, the Monterey Inn & Marina in nearby Stuart offers rooms for under $80/night. I lived on the island for more than eight years. It can be crowded in the winter and spring, but summer and fall are delightful. Among my favorite spots is Bathtub Beach near Stuart, where the coastal formation absorbs much of the wave action and makes for a spot that is tranquil and friendly for children at play. Nearby, the House of Refuge at Gilbert's Bar is worth a stopover. It's the only survivor among an original 10 such houses, spaced out along the Florida coast as places where shipwrecked sailors could find refuge. Admission is $8 for adults. Not far south of the Costa Rica-Panama border is the Isla Bastimentos, a place that is home to Red Frogs and a largely undiscovered stretch of beach. It's sheltered from hurricanes and just difficult enough to reach that legions of tourists are rarely found on its shores. The nearby town of Bocas Del Toro serves as an outfitting point for a trip to Red Frog Beach, with a variety of lodgings (including hostels and budget hotels) and a small airstrip for connecting with San Jose and Panama City. Water taxis take you to the beaches, which are favorites of surfers but also somewhat dangerous for swimmers due to the undertow conditions that often exist. There is a daily usage fee of $3/person, a modest fee to enter what is often your own private stretch of sand. Bocas Bound Hostel and Lodge on the island caters to a younger clientele, but provides basic accommodation and tasty meals without going all the way back into the village. You can also enjoy a zip-line course and access to excellent snorkeling and dolphin watching. Nerja, Spain offers an alternative to the concrete and high-rise Costa del Sol. It is a bit easier here to avoid the tall towers and find small, budget hotels with beautiful views of the beach. Nerja itself is a picturesque pueblo blanco village that has earned the nickname "Jewel of the Costa del Sol." It's about 50 km. east of Malaga, and a ride from that city's airport to Nerja takes 40-90 minutes, depending upon whether you travel by car or bus. Koh Phangan, Thailand has been known for hosting kings and backpackers over the years, but it is becoming a popular tourist destination for a wider variety of traveler these days. The island in the southern Gulf of Thailand can be reached by boat from the provincial capital of Surat Thani, which is connected to Bangkok by bus. Beach resorts and budget hotels here offer private bathrooms and a full breakfast for under $50 USD/night.